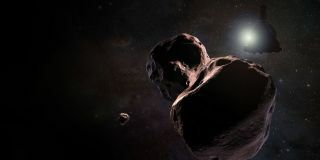 An artist's concept of MU69, the next flyby target for NASA's New Horizons mission. The icy object may have one or more moons. NEW ORLEANS — When NASA's New Horizons spacecraft arrives at its next destination in 2019, it may find more primordial objects than NASA had anticipated: Researchers have announced that the probe's next target, an icy object known as 2014 MU69, may have at least one moon and could even host a swarm of natural satellites. "Then, on July 17, we hit the jackpot," Buie said. Five observatories spread across Argentina provided a wealth of data that revealed the object's unusual bilobed shape — but once again, the object wasn't sitting where previous observations suggested it should. And that data transfer will take a long time. From MU69 — which lies nearly a billion miles beyond Pluto— a one-way signal from New Horizons will take more than 12 hours to get to Earth. Plus, the probe can send only a little at a time — it took 16 months to get back all the data from its Pluto flyby. According to Stern, getting all of the data back on the ground from New Horizons' visit to MU69 will take all of 2019 and most of 2020.